A few years have gone by since I wrote about the original Almond touchscreen wi-fi router and range extender and my consulting relationship with Ram Malasani, the founder of the company that makes it. During my brief stint writing Almond+ documentation Ram supplied me with a couple of other Almond+ test units, both of which have performed flawlessly, plus a few low-end smarthome gizmos (e.g., power plugs and motion detectors) and, eventually, a 2Gig CT100 Z-Wave thermostat. The CT100 got my attention. My wife and I have a cottage in upstate New York, where winter temperatures routinely drop into the single digits. Being able to monitor the cottage’s thermostat remotely and turn it up before arriving sounded pretty sweet. Truth in advertising prompts me to admit that as easy as I made this installation appear, there’s an important power issue about the CT100 that, for the sake of brevity, I left out of my video. How Long Will the CT100 Work on Batteries? 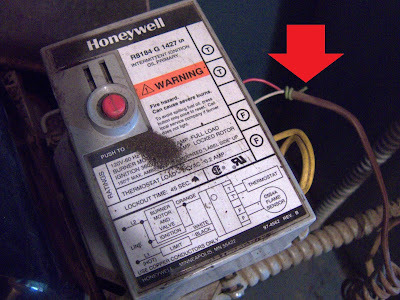 As my installation makes plain, the Honeywell thermostat I removed, like an old-fashioned landline telephone, doesn’t need an external power source to function. The CT100, on the other hand, needs at least four AA batteries. Long before installing the CT100 I removed the cover from the Honeywell unit and, with a little online research, determined that neither of the two wires it uses supplies current. Once I’d satisfied myself that the CT100 would work on battery power alone I began to wonder: just how long would it work? In principle I wasn’t crazy about using a thermostat whose batteries had to be changed periodically, and frankly I was worried about the batteries running low in the dead of winter when the cold and snow make upstate visits a hassle. Then there was the prospect of a power outage. In the absence of power the original Honeywell thermostat is also useless, but I wasn’t sure if the CT100 and Almond+ would resume chatting to each other—and to me via the Internet—once the power came back on. Especially since, long before installing the CT100, I’d done a test pairing with Almond+ and noticed that after a few days Almond+ seemed to lose touch with the thermostat. 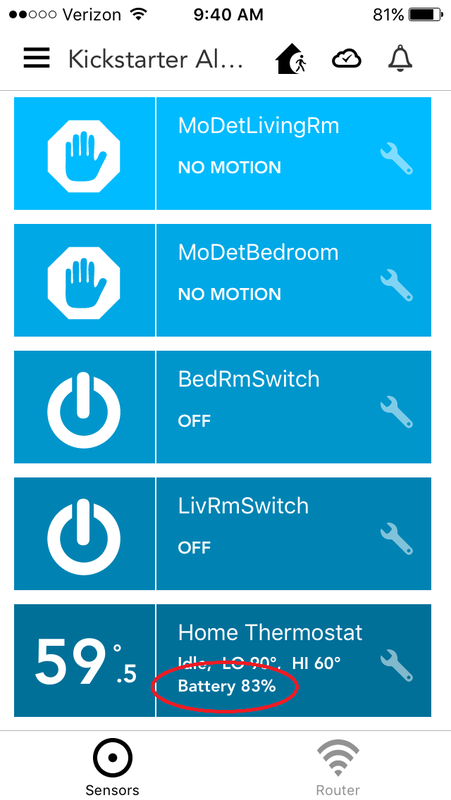 That, at least, was the conclusion I reached when I used the free iOS app that Securifi provides for monitoring and controlling connected smarthome devices. While at the cottage upstate I’d try turning up the heat on the working Honeywell thermostat, wait for the temperature to rise a few degrees, and then, once the CT100’s internal thermometer also reflected the change, see if its new temperature readout successfully reached the app on my iPhone. Rebooting Almond+ solved the problem, but only temporarily. In a matter of days it would once again lose touch with the CT100. When I told Ram about the problem he suggested I try using a beta version of the Almond+ firmware—one that allows a user to set automated rules, including one to tell Almond+ to reboot at regular intervals. 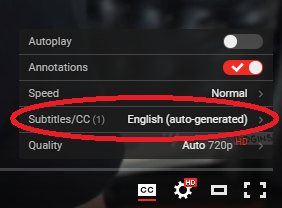 (BTW: This beta version has since been released.) Sure enough, after telling the firmware to reboot Almond+ every morning at 5 AM I found it reliably communicating with the CT100. But then, I was still stuck with a thermostat that relies on battery power to function. And yet, when I took a closer look at the thermostat wiring coming out of the wall I discovered there weren’t two wires sheathed in the bundle, there were three. One had been tied off because it wasn’t needed. Would it be possible to replace this controller with one that supplies current? There is a control that includes a 24 volt transformer that can power the thermostat. Here is the Honeywell part #: R8184M1051/U. It has pretty much the same high voltage wiring as your control. Hope this helps. That 83% charge is worrying. It’s been only 5 weeks since I installed the CT100. If its batteries lose 17% of their power every 5 weeks they clearly won’t last more than 6 months! Aside #1: When I first installed the batteries in the CT100 it reported their charge as 97%, so I suppose it’s arguable they’ve lost only 14% of their power over the first 5 weeks. Aside #2: For a while I had my iPhone’s Almond app set to notify me anytime the CT100 recorded a temperature change. So every few hours I was getting push notifications about swings of a single degree as the thermostat kept turning the furnace on and off to keep the house at the steady 60 degrees Fahrenheit I’d selected. Suspecting these notifications were adding to the drain on the batteries, I eventually turned them off. So it’s possible that alarming 17% loss is attributable largely to my profligacy with push notifications. And this just in: yesterday’s edition of The Verge reports that Almond+ now supports the Rolls Royce of thermostats, the Nest, as well as such other Nest products as the Nest Protect smoke detector and Nest Cam security camera. A little Googling tells me the Nest thermostat currently goes for about 3 times the price of the CT100—and the Nest definitely requires an external power source, so running it on batteries isn’t an option. 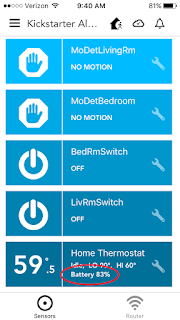 A brief look at the Nest’s installation guide also suggests that the CT100’s installation instructions, though text heavy, are less ambiguous and more comprehensible. Of course, as my video makes clear our furnace is pretty basic—so my installation was straightforward. And the Nest supposedly learns about your heating preferences and will act on its own without requiring your intervention. Which could be cool. For the moment, though, I’m pretty happy with the CT100. Hiding in Plain Sight: Super Panavision Cameras in John Frankenheimer's "Grand Prix"
Note: this blog post contains what some may consider spoilers. I saw John Frankenheimer's movie Grand Prix in a theater in Times Square not long after it was released for the holidays in 1966. Call it January or February 1967. Either way I was an impressionable preteen and Grand Prix was an intensely visual movie that shunned many of the lazy conventions of mid-60s moviemaking—most notably the use of rear projection (referred in the biz, I think, by its initials, RP) for scenes taking place in cars. Grand Prix is all about cars, after all; I admire Frankenheimer for deciding that RP had had its day and needed to be banished for any race car movie intended to look remotely realistic. OK, so Turner Classic Movies owns the rights to Grand Prix and, because the movie managed to win Academy Awards for Best Sound, Best Film Editing, and Best Sound Effects, TCM trots it out every year to show during its “31 Days of Oscar” run up to the Academy Awards ceremonies. Thanks to TiVo, the other day I snagged it and watched it for the first time in perhaps 40 years—maybe longer. Grand Prix isn’t a great movie, and I’m not even sure it’s a good one. Its bland behind-the-scenes melodrama was probably creaky even in 1966, but that’s not why anyone would ever bother watching it, then or now. The races are the thing, and they’re captured with as much vigor, expertise, style, and motion as Hollywood could muster in the analog era. What I hadn’t noticed when I was a kid and only noticed now, though, was Frankenheimer’s willingness to use—and flaunt—what must have been the latest in camera technology back in 1966: handheld Super Panavision cameras! These frame grabs courtesy of my TiVo Premiere, my Panasonic Viera HDTV, and my Canon S110 digital camera. Apologies for those annoying moire patterns. The guy on the stretcher is Brian Bedford as race car driver Scott Stoddard; he’s just had a terrible accident at Monaco and is being rushed to a medical rescue boat. And the guy in the beige sweater following behind is carrying what I’m satisfied is a handheld Super Panavision camera. If you’re old enough you can imagine Frankenheimer’s rationale for this kind of cheeky visual cheat. In the 1960s footage shot with handheld 16mm movie cameras had become a staple of the evening news. And because by then there was a critical mass of movie and still cameras shooting all major public events and catastrophes (Grand Prix even devotes a few moments trying to work up the audience’s outrage about news photographers who swoop in to get graphic footage of gory race car accidents) most everyone recognized and even expected them. That civilians couldn’t tell the difference between the lightweight 16mm movie cameras deployed by TV news crews and the hefty 65mm Super Panavision hardware Frankenheimer’s crews were using is something I'd guess the director was banking on. If you’ve got a DVR, stop it at this shot and, when you restart, keep your eye on the Super Panavision camera at left. You’ll see the unmistakable rotation of the film sprockets in the camera magazine, demonstrating that this camera is indeed shooting. Nearly as interesting as these inside-baseball visual cheats is Frankenheimer’s—or it may have been director of photography Lionel Lindon’s—preference for making these hand-held shots rock steady. They never call attention to themselves. Indeed, in the late ’60s and early ’70s, before the Steadicam and Panaglide handheld camera stabilization systems were invented, it became common for directors to lend their films some instant cinéma vérité cred by inserting shaky handheld point-of-view and action-news-style shots. Frankenheimer exploits these handheld Super Panavision cameras elsewhere in the movie, especially when he needed to film scenes in cramped location interiors. (Impressively, I don’t think any of Grand Prix’s interiors were shot in a studio.) But unless you’re paying attention you simply don’t notice these shots were achieved without standard tripods. Frankenheimer was willing to get rid of RP, and I thank him for that. But when it came to handheld shooting, at least, his visual style remained adamantly old school.